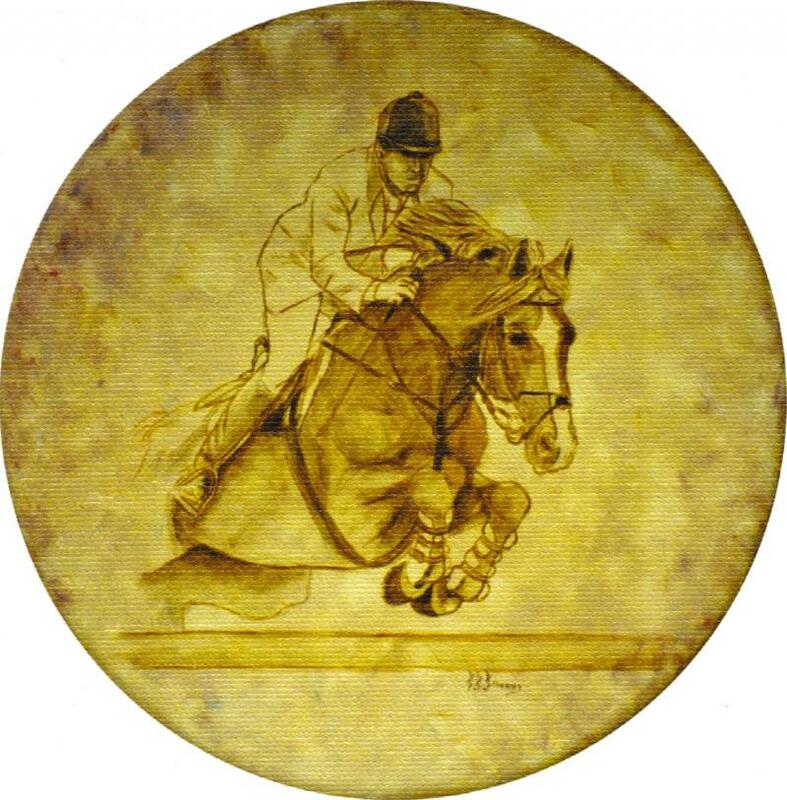 We are delighted to bring you our latest equestrian image products. Additional images will debut in the coming months, so continue to check our website for new offerings. You can purchase the horse prints on this page by selecting the "Buy Now" PayPal button. To buy prints on paper, note cards, and silk scarves go to the Buy Ghost Horses' Items. Any of these would make a wonderful gift! This Giclee print on canvas measures 20 inches in diameter. It is in brown tones and mimics the look of a drawing/painting on leather. 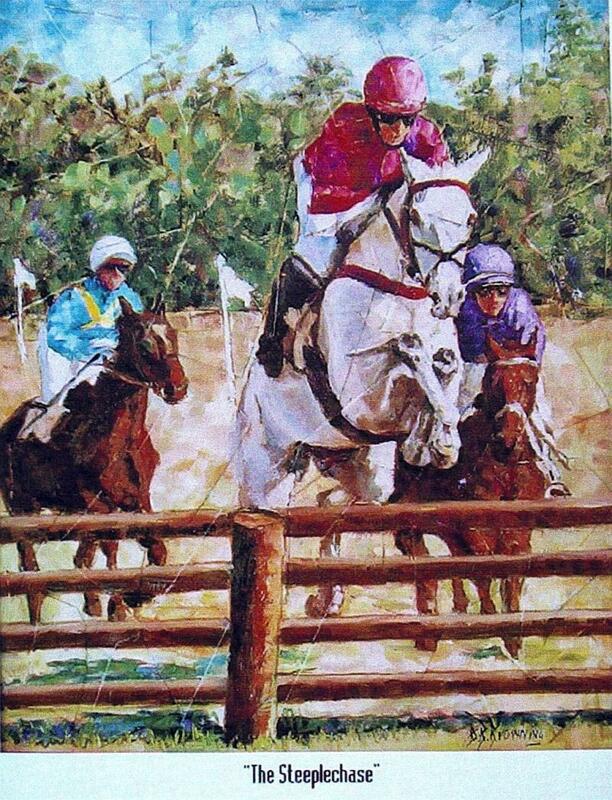 This will be a great edition to add to your Sporting Art collection! This is a 16" x 20" Giclee print on paper from an original oil painting on canvas. This remarkable reproduction rivals the original. Hanging on your wall this has the look of a fine original oil painting! This is a 11" x 14.5" Giclee print on paper. Thoroughbreds in action can decorate your wall. This print is signed by artist. Buy it today to insure you can own it! This print on stretched canvas measures 18" x 22". 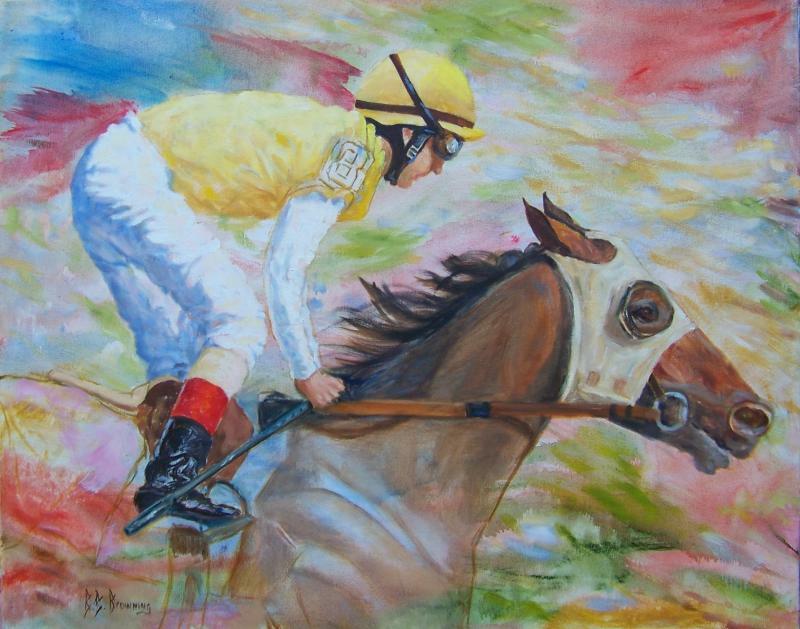 Action of thoroughbred racing is the theme of this painting. Own it today! All of our prints replicate the original in the most remarkable manner. This is an 11" x 14" Giclee print on stretched canvas. This size is perfect as a gift or for yourself because it will hang almost anywhere. This is a 11" x 14" Giclee print on canvas. The jockeys are about to saddle up and be led out to the track for the parade to the gate. Warm sunshine makes this scene glow. 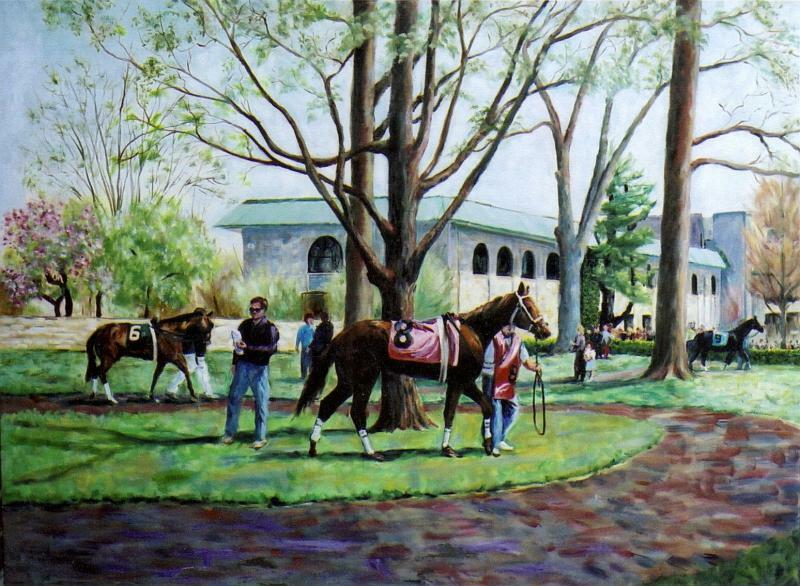 An 11" x 14" Giclee on canvas, this image is of the famous Churchill Downs. Every racing fan would love this print! This is an 18" x 24" Giclee print on stretched canvas depicting the jockey and horse about to be led out to the track for the race! This is an 18" x 24" Giclee print on stretched canvas. Viewing the horses and jockeys in the paddock on an autumn afternoon brings such great memories. The original painting was created using Beth's special technique that appears as though you are looking through cracked glass. 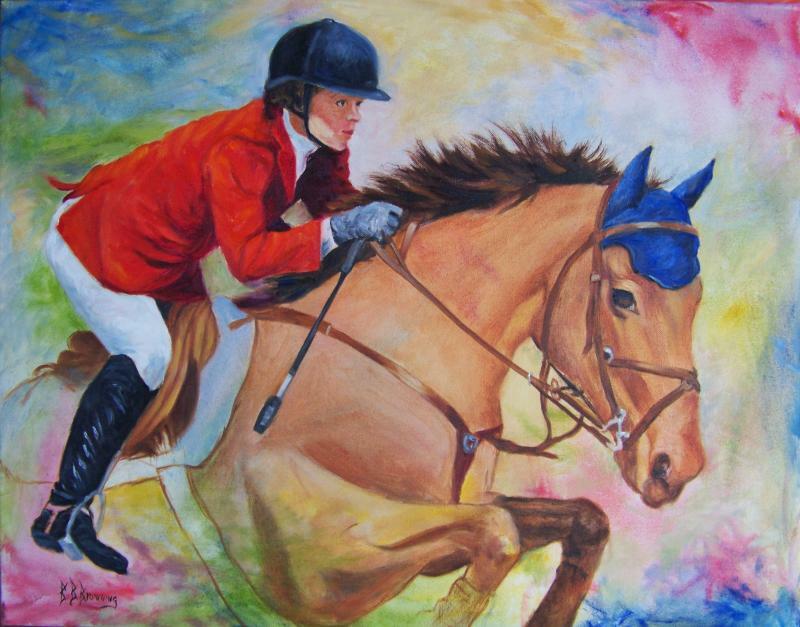 This is an exciting image of "sporting art" that Beth has created. This print on paper measures 12" x 16". Edition of only 100! Buy it today! Limited supply. This is a 11" x 14" Giclee print on canvas. Beth's technique of painting on a leatherized canvas offers a rich quality of the oil painting that could be part drawing and part painting. All of our Giclee prints are of exceptional quality and we guarantee you will love this look hanging in your home. This is a 16" x 20" Giclee print on stretched canvas. 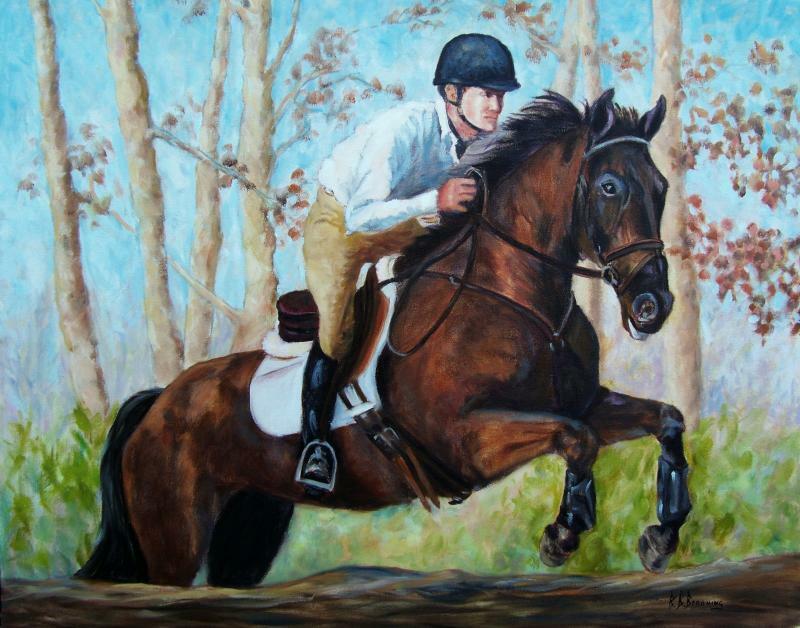 As can be seen from this painting, Beth's ability to capture the horse world is amazing and you will be reminded of these events when it hangs on your walls. This Giclee print on canvas is 11" x 14". I painted this image especially in preparation for the World Equestrian Games. Own this colorful horse and rider today. A 12" x 36" Giclee print on stretched canvas. Delightful image of horses who share a home. A perfect size for a space over the sofa or bed. This is a 11" x 14" Giclee print on canvas. A wonderful picture of a groom leading the horse in from the pasture. The soft background depicts the board fences so often used in horse country. You will enjoy having this bay horse in your home or office. This Giclee print is 18" x 24" on stretched canvas. I remember the day I took these photos for the painting and thinking the sun made this cool day so much more enjoyable! When you own this print you can feel the same! This is a colorful depiction of the jump out of the gate in a thoroughbred race. Is measures 12" x 24" on stretched or mounted canvas. We gladly fullfill wholesale orders. Use the Contact Us page for additional information.